Gilbert Felli, IOC Olympic Games Executive Director, opened the 2-day Briefing Session at the National Training Center in Tokyo on November 14, 2013, gathering 200 delegates from the Japanese and Tokyo Metropolitan Governments as well as NFs including baseball and softball. President Thomas Bach sent a video message of encouragement by expressing his belief that Tokyo will prove to be an extraordinary host after the 7 years’ long journey. 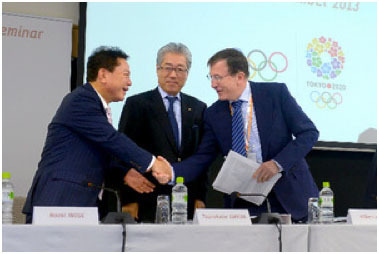 He will visit Tokyo on November 20 to meet IOC partners and other stakeholders to the 2020 Tokyo Olympic and Paralympic Games.